Tomson Highway is at it again. The pianist, playwright, novelist, honorary doctorate degree holder, and past Writer-In-Residence, will be playing his own music in a play he wrote opening Oct, 12. The (Post) Mistress is co-presented by Pleiades Theatre and Théâtre français de Toronto, and is a one-woman-act about a Métis woman working in a post office, which alludes to some of Highway’s own beliefs about death. Tomson Highway is at it again. The pianist, playwright, novelist, honorary doctorate degree holder, and past Writer-In-Residence, will be playing his own music in a play he wrote opening Oct, 12. The (Post) Mistress is co-presented by Pleiades Theatre and Théâtre français de Toronto, and is a one-woman-act about a Métis woman working in a post office, which alludes to some of Highway’s own beliefs about death. “It’s kind of hard to talk about the inspiration because there’s a surprise ending and the inspiration for it gives the surprise away. In Native spirituality… cosmology… there is no death. People, when they die, they don’t go to heaven or hell, they just get translated into a different energy,” said Tomson. “The Post Mistress is a human soul, who handles the mail,” he said. Tomson was born in a small village in northern Manitoba. He attended an Indian residential school during his youth, and later attended the University of Manitoba and the University of Western Ontario, as well as school in London, England—all three for music and English literature. Outside of Tomson’s many travels—for work, study, or pleasure—he has spent much of his time staying in a family cottage on a lake near Sudbury, Ont. There, he received part of his inspiration for The (Post) Mistress. “I’ve been going to post offices all my life… and sometimes falling in love with the people behind the counter… In the summer time, I live in a cottage out in the country, and there’s a post office. This woman has been working there for over 25 years, and she knows everybody,” he said. Highway’s sentiment about the real life post office maven is not romantic. He falls in love with many people on his travels, he says, because he genuinely enjoys meeting strangers and listening to their stories. He sees this woman in her post office chair as someone who has valuable insight into the lives of everyone in the community around her. And possibly more insight than the people of the community would feel comfortable with. Highway wanted to use this experience in his work in a way that would also share what he believes is the main difference between the Christian view of death, and the First Nations perspective. “I just find the traditional Christian view of death, whether we go to heaven or hell, it’s terrifying, it’s traumatic. In Native cosmology, it’s a circle, and you just go to another part of the circle. You can be a blade of grass, or a leaf on a tree. That’s why life on this planet is so magical, because the dead are still with us. It’s beautiful,” he said. And while Highway doesn’t ordinarily play the musical scores for his own theatrical pieces anymore, he made an exception for this one, he said. “For this one, they convinced me to. They said because it would sell better if the writer was on stage…. So they twisted my arm,” he said, “And they’re paying me well,” he added with a laugh. Patricia Cano, actress/songstress for the play, has been on tour with Highway before, so hearing the Cree language is not new for her. But she did require some help from Highway in learning to speak it, and sing it, in order to perform the play’s Cree songs. “I didn’t go out and actively do research because it’s written about a woman who happens to be from a small northern Ontario Francophone town. (Highway) wrote it about a place he and I know very well,” said Cano. “But Tomson shared the proper pronunciation of those words... I wouldn’t speak anything in life or on stage if I didn’t know the meaning of it,” she said. The music for the play is moving, and unique, said Cano. There are Brazilian rhythms featured in some songs, while the lyrics are still Cree. One of her favorites is a Cree prayer song, which is particularly beautiful, she says. “I’ve been travelling with (Highway) since 2001. We’re family. 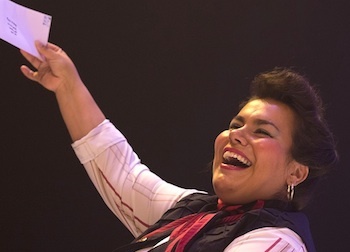 Cree has been in my ear since then... I’m very honored to speak the language in this play, and looking forward to learning more and more words, and learn a little more about the Cree culture every time,” said Cano. As for producer/director John Van Burek, this is his first time working with Highway. He is not intimidated, however, as he has admired Highway’s work for years. For this play, it was the merging of cultures—with more than just the Métis Post Mistress—that sold him. “Well, the music was just wonderful. That was the first thing I heard… He’s very much influenced by his own cultural background. He writes plays that come out of First Nations traditions... For me that’s an exciting thing, because I don’t always get to work with that,” said Van Burek. “He’s very international. He’s a man of the whole world, and he’s a musician and a trained pianist. Mixed in with the main character is a very rich combination of cultural influences and style,” Van Burek said.